Later today the United States national Australian Football side, the Revolution, take on Canada's Northwind in the first international for 2007. Despite often being very competitive, the northerners have never managed to defeat the Stars and Stripes in Aussie Rules. The following is a press release from AFL Canada's Bill Frampton, previewing the match from the Northwind's perspective, including the squad and some history of their past meetings. WFN believes that the match will see the debut of several new players, including Vancouver's young gun Scott Fleming, probably the first "graduate" of the successful North Delta Junior AFL. The lineup also features players from Ontario's 2006 debut club, the Central Blues. 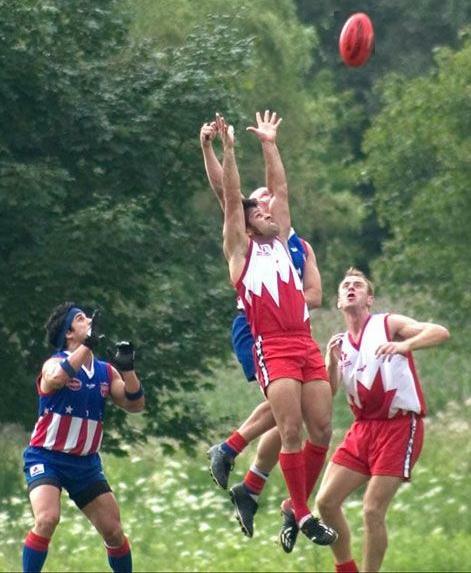 The 2007 Australian Rules football season kicks off this Saturday, January 20th at 1:30 PM CST at Tom Bass Park in Houston when the United States Revolution play host to Canada's Northwind. This will be the seventh meeting between the two countries and the first of two games planned this year. The teams will meet in a return match in Vancouver at the beginning of August. The Northwind take a 2-game winning streak into this one after finishing the 2005 International Cup with wins over Spain and South Africa. Northwind players have been training for this game since early November, Ontario Australian Football League players at the Hangar in Toronto and western players at locations in Vancouver and Calgary. Under the leadership of head coach Mark Block and team manager Marty Walter, the Northwind players are looking for their first win over the Revolution. The team is a blend of veterans from past Internationals and new talent, with captain Stefan Leyhane leading the way in his 18th appearance for the Northwind and seventh as captain. Northwind fans are well aware that the last two meetings between the teams were close ones with the Revolution winning by two points four years ago in Pittsburgh and 12 points three years ago at Humber North Oval in Toronto. Both teams want a win as they start building toward the 2008 International Cup in Australia.